Shop at A-E Distributors in Rochester, New York, and you’ll find new and re-manufactured box springs and mattress sets that are in great condition. We are a wholesaler, but are open to the public three days a week. Re-manufacturer mattresses and boxes, made from reclaimed materials. Like recycled foam and wood, also steel to make the springs. That is the reason for the two bedding tags. One for second hand reclaimed materials and one for the brand new materials. All parts are inspected and then sterilized before assembled. When completed they are put in heat sealed plastic bag ,they are now in excellent condition. This process started in the 1960’s. It’s still being used today, even by the Big Brands Name bedding companies. Because the recycled materials cost so much less. 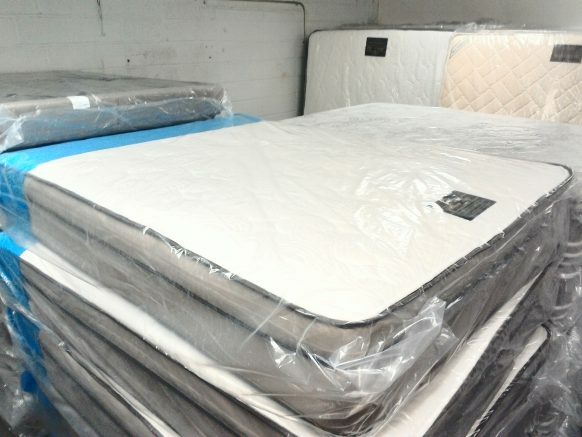 The factory can build a better quality mattresses costing less than brand new. Re-manufacturer bedding is used primarily for nursing homes, hospitals and other institutions. Today they are being offered to the general public at great savings. For special pricing and current on going sales. Contact one of our dealers near you. Shop with us for everything from basic smooth tops to super plush pillow tops. Our most popular mattresses are the plush and pillow top styles, and we also carry specialty box spring sizes for split queens and split fulls. These come in two pieces for hard-to-fit places. For your convenience, we also sell floor models and offer products from major manufacturers like Sealy™, Simmons™, Serta™, and Sterns & Foster™. Mattresses from Kingsdown™, another high-end manufacturer, are also available. Contact us in Rochester, New York, to find out more about the mattress sets we have in stock.